What is a Keylogger? How does it work? A Keylogger (also called keystroke logger) is a malicious application that hooks into your system in order to capture all your keystrokes in real time. Keystroke loggers are designed to steal the high-value information that the user inputs while using computer. Keyloggers can be set up to grab all the text, or specifically just passwords, credit card data or your private conversations. All of the recorded keystrokes are being saved in a hidden location and sent to the person who managed to infect your PC with a keylogging malware. For example, you can download your favorite program from the internet. In case when the file got infected, this program will work just as usual but with one small difference – it will also install a keylogger in background, without notifying you about it. People tend to think that anti-virus software is enough to protect against them – nothing could be more wrong than that. Anti-virus software is not enough to protect against modern spyware. Keylogging malware saves everything you type, including your passwords and credit card data. Why Antivirus software is ineffective against keyloggers? While anti-virus databases will always remain an essential part of any security solution, they cannot be relied upon on their own. This is because they are reactive; they rely on databases of known viruses and malware in order to detect and remove a threat. Sure, they may recognise a well-known commercial keylogger or a virus that’s been out for six months, but most hackers are more sophisticated than that! If a keylogger is not known to the security application then it will not find it, rendering the so-called “real time protection,” of the world’s best known antivirus suites ineffective. It can take months for antivirus labs to discover a threat, which in the mean time can cause serious damage. Protecting against modern monitoring malware requires an entirely different approach. 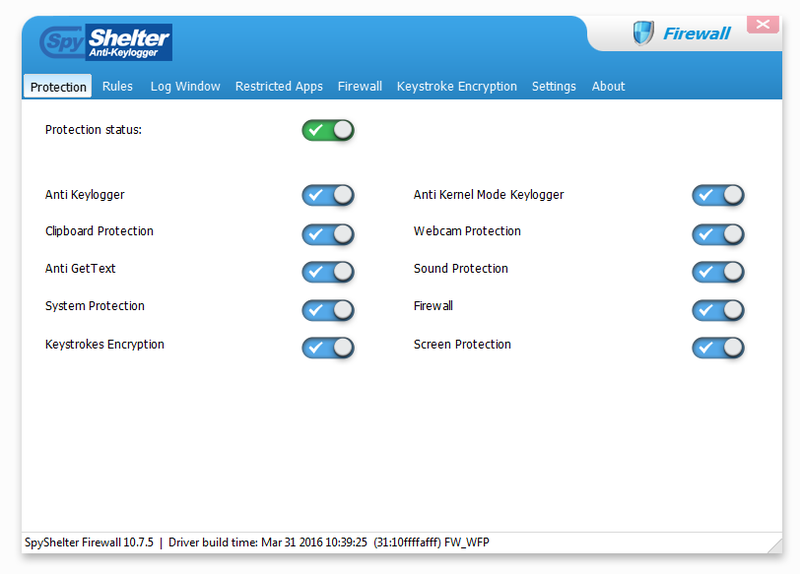 The only way to truly protect yourself from keyloggers is with a dedicated real time anti-keylogger which looks for and blocks suspicious logging behaviour. SpyShelter is an award winning anti-keylogger which was specifically designed to stop all monitoring activities. Even with keylogger present in the system, SpyShelter manages to scramble the text, making it useless for keylogging malware. Download 14 day free trial version. All features unlocked!